Mango leaves to measure intracellular Temperature. Mango leaves are being used by IIT Bombay for bioimaging and measuring intracellular temperature. 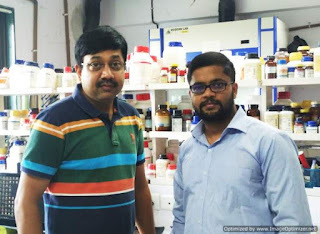 Using mango leaves to synthesise fluorescent graphene quantum dots (nanocrystals of semiconductor material), researchers from the Indian Institute of Technology (IIT) Bombay have been able to produce cheap probes for bioimaging and for intracellular temperature sensing. Unlike the currently used dyes, quantum dots synthesised from mango leaves are biocompatible, have excellent photostability and show no cellular toxicity. The results were published in the journal ACS Sustainable Chemistry & Engineering. The quantum dots, 2-8 nanometre in size, were found to emit red luminescence when excited by UV light. “Even when the excitation wavelength was 300-500 nanometre, the emission from the quantum dots was at 680 nanometre. The quantum dots have smaller and larger fluorescent units. When the excitation is at lower wavelength, the smaller units transfer energy to the larger units and there is red emission. And when the excitation is at higher wavelength, the red emission comes directly from the larger units, thus remaining excitation-independent. “The graphene quantum dots can be used as a nanothermometre. Besides measuring intracellular temperature increase, they can be used for measuring temperature increase in cancer cells and when there is inflammation,” according to IITB. Since the quantum dots emit red light, they can be used for making organic light-emitting diodes as well,. The world’s largest artificial sun has been set up at the German Aerospace Centre (DLR). It consists of 149 high-performance, solar powered Xenon short-arc lamps. Temperature at targets can reach up to 3,000 degrees C. The facility is intended to produce fuels such as hydrogen. NASA says' Venus twin is found. Astronomers, using NASA’s Kepler space telescope, have discovered a Venus like planet orbiting a dim star that is one-fifth the diameter of our Sun and is located 219 light years away from Earth. The newly found planet is only slightly larger than Earth, and it tightly embraces its low-temperature star called Kepler-1649, encircling it every nine days. Insight into planets The tight orbit causes the flux of sunlight reaching the planet to be 2.3 times as great as the solar flux on Earth. For comparison, the solar flux on Venus is 1.9 times the terrestrial value. The discovery will provide insight into the nature of planets around M dwarf stars, by far the most common type in the universe.